Militants use all types of weapons to shell Ukrainian positions in the ATO zone. Snipers are active in Donetsk and Mariupol sectors. Meanwhile, Ukrainian police task force is patrolling Toretsk. Kyiv, July 9, 2016. 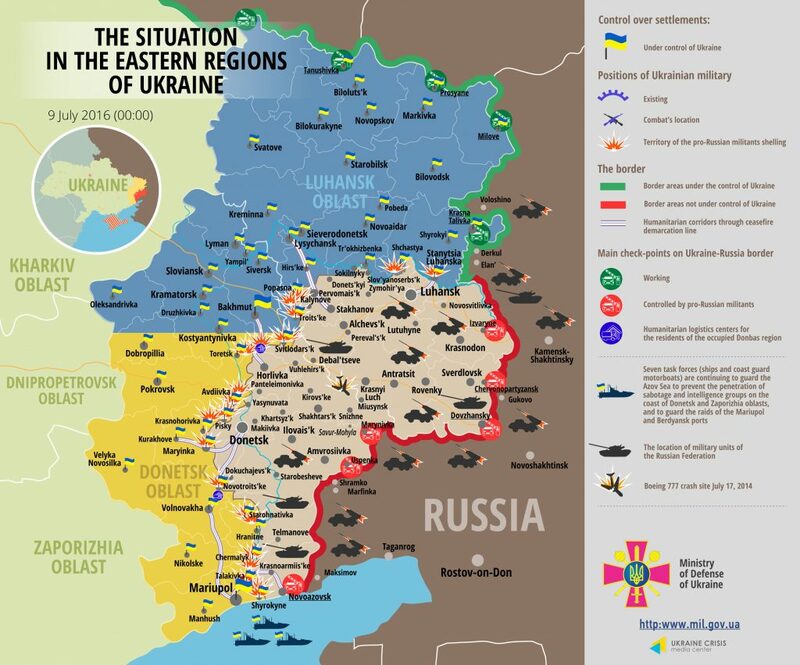 The situation in the Donetsk sector in the ATO zone remains the most difficult. Two thirds of all the attacks are conducted using mortar launchers, mostly 120-mm. The situation was the most restless at the Svitlodarsk bulge, northern outskirts of the temporarily occupied Horlivka and in Avdiivka industrial area, informed the spokesman of the Presidential Administration on ATO related issues Colonel Andriy Lysenko at a press briefing at Ukraine Crisis Media Center. “The enemy launched almost 200 mortar shells at Ukrainian positions last night in these areas. Moreover, brief use of mortar launchers was registered in Troitske, Novoselivka Druha, Pisky and Nevelske,” he said. Militants were actively using armor at the Svitlodarsk bulge, namely in the vicinity of Luhanske settlement. A sniper was active there as well. According to Col. Lysenko, the situation is difficult in the Avdiivka industrial area. Russia-backed militant groups are shelling Ukrainian positions from the south using all availably weapons excluding tanks and artillery. Militants violated the ceasefire in the vicinity of Donetsk airport using armor, mortar launchers and small arms. In the Luhansk sector Russian proxies are shelling Novooleksandrivka, Novozvanivka and located on the right bank of Siverskyi Donets River Rayivka. Mortar launchers were used in two latter cases. Militants shelled Stanytsia Luhanska again after a month’s break. “Militants launched 20 122-mm shells near Vodiane in the Mariupol sector. Moreover, the enemy used heavy armor, in particular 120-mm mortar launchers, in Starohnativka, Pavlopol, Talakivka and Shyrokyne, using these prohibited weapons during the day. Snipers were active in Mariinka, and hostile shelling involving use of grenade launchers of various systems and large machine guns lasted over two hours. Hostile attacks of similar intensity were registered in Shyrokyne,” informed the spokesman. According to him, nine unmanned aerial vehicles were used by militants for aerial reconnaissance in all three directions yesterday. One Ukrainian serviceman died in combat yesterday and six were wounded in the last 24 hours. At the same time, six militants were killed yesterday and seven more injured. “So-called 11th separate motorized rifle regiment, its subdivisions shelling ATO troops in the vicinity of Avdiivka, incurred the biggest losses. Two militants died and four were wounded as a result of ammunition equipment blast in a dug-out shelter in the frontline,” said Col. Lysenko. He informed that special police task force started working in Toretsk. It takes anti-terrorist measures and provides aid to the local inhabitants. “These are 13 dismounted patrols and mobile squads patrolling the town and the neighboring settlement 24/7. They achieved the first results – drug dealers were detained, a group of people stealing coal neutralized and illegal weapons seized. Law enforcement officers are patrolling houses of local inhabitants, raising awareness and checking information on possible law violations,” said the spokesman.